The Girl Who Drank the Moon is my first Kelly Barnhill book and is guaranteed not to be my last. From the very beginning of this book to the very end I was completely captivated by the story. Open the pages of The Girl Who Drank the Moon and dive into a fantasy and adventure story which is both unique in nature and also remarkably well-crafted. Barnhill is a beautiful writer of prose and I enjoyed the sentences which made up beautiful paragraphs and chapters and book. The story begins with the explanation that every year the people of the Protectorate leave the newest born baby from their village in the forest as an offering to "the witch." No one has ever seen the witch but they are well-familiar with her and the overhanging threat that she will do Something Awful if they do not sacrifice one of their young to her on an annual basis. At the very beginning of the tale, we are introduced to a woman being forced to give up her baby girl and who succumbs to sorrow and madness as a result. She is locked away in a tower in the local abbey where the sisters see to her care. Or do they? In the forest lives a witch who never asked to become one. Her name is Xan and it is she who takes the babies which the Protectorate leaves in the forest. However, all is not what it might seem. Xan takes the babies without understanding why they have been left and she delivers them to loving homes in a village on the other side of the forest. However, one day she collects a baby girl who captures her heart. Xan names the baby Luna and accidentally feeds her with moonlight. In so doing, Luna herself is enmagicked with a magic so powerful that Xan is forced to hide Luna's magic from her until her thirteenth birthday. Xan hopes that in time and with age Luna will learn to better control her magic and use it responsibly. 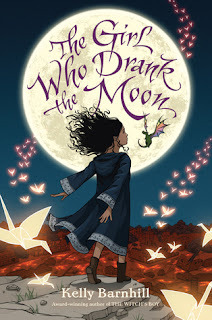 The Girl Who Drank the Moon follows Luna, Xan, the woman in the tower, and also a young father from the Protectorate who offers hope to a village shattered by sorrow at having lost so many babies to the unknown witch. Kelly Barnhill has woven together a beautiful tale of magic. Her imagination seems to know no bounds. The reader is left to marvel at and enjoy this story of tragedy and hope. The best way I know to describe it is to say that it reads like ancient lore and legend. There's a timeless feel to it that makes you to think that you've heard this story somewhere before, although perhaps not quite in the same way. There's a uniqueness to the tale which is immensely satisfying as a reader. It's always a pleasure to be told a new story in a way that is not entirely predictable if for no other reason that the story is so well-told that the reader/listener is patient enough for things to unfold as they are meant to all in good time. Barnhill is a reader's dream and no, I don't feel like I'm being overly dramatic in saying so. However, I want to be cautious that I don't puff the story up so much that when you finally get around to reading it you'll wonder what all the fuss was about. Not that you'll want to wait a long time to get to this, because it's so fun and fanciful that you'll probably want to rush right off and grab a copy. If you enjoy it half as much as I did, that'll be plenty. In terms of worldview, I would say that more conservative readers will not like The Girl Who Drank the Moon if they are skittish about magic and witches. However, this new title has nothing over Harry Potter or Narnia or Lord of the Rings. While there is no real distinction made between what is "white magic" versus what is "black magic", there is a clear distinction between good and evil. The right side wins, leaving no ambiguity or requesting of the reader to be sympathetic towards those in the wrong. It's a clear cut story full of delicious magic and imagination of the best sort. This book is classified as Middle Grade Fiction which I think is entirely appropriate. I plan on handing it over to my ten-year-old to read next and I fully anticipate that he will enjoy it. The Girl Who Drank the Moon is a book I am happy to keep on our home bookshelves to be enjoyed by all when they are ready for it. I can imagine myself enjoying it again at some future date. Many thanks to Kelly Barnhill for writing this story and to Algonquin Young Readers for publishing it. I was sent a copy for review purposes. I received no additional compensation and all opinions are 100% my very own.